Mourning Around the Christmas Tree « Midlife Crisis Crossover! Plan A for me tonight was to write about either of the two new movies I’ve seen in theaters over the past week. 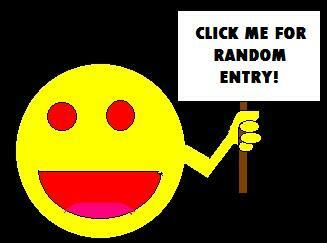 I have a few Plan B’s stored up in case of mental short-circuit. Tonight, I just…can’t. Nothing I want to enjoy sharing is working. Ever since I got home, I’ve found it impossible to concentrate on writing because I first had to spend a while catching up with online anguish over the San Bernardino shootings. And, bringing up the rear in all news roundups, the smaller shooting in Savannah, dwarfed and nearly invisible next to San Bernardino, like that time The Love Letter opened the same weekend as The Phantom Menace. That’s a horrible, boorish comparison, to say the least. But that’s where we seem to be headed, into a future in which so many are growing up to become disgruntled, corrupted, fundamentally broken, spiritually deformed gunslingers that the career track has become overcrowded and they’re now vying for public attention like some lethal breed of fame-starved pop idols. Soon they’ll have to start hiring black-market publicists to coordinate their outbursts with each other so none of them overlap and each shooter can have a chance to dominate the news cycle for a minimum number of hours before the next shooter steps up to the range. Meanwhile in the land of the powerless but outspoken, by which I mean social media, anti-gun advocates flatly refuse to rest until and unless all politicians nationwide agree to nothing less than a nonpartisan, unanimous, no-strings-attached passing of a bill requiring President Obama to ask the Doctor nicely to go back in time and uninvent guns altogether so humanity will never, ever have them. Go back to the past, nuke them from the timeline. It’s the only way to be sure. In a more practical vein, ThinkProgress editor Igor Volsky took to Twitter and published the individual dollar figures that the NRA allegedly donated to scores of American politicians in exchange for responding to active-shooter events with only “thoughts and prayers” while promising to mention absolutely nothing about gun control. If true, I look forward to the ensuing public debates tomorrow between those political-office placeholders and the torch-wielding villagers they quote-unquote “serve”. 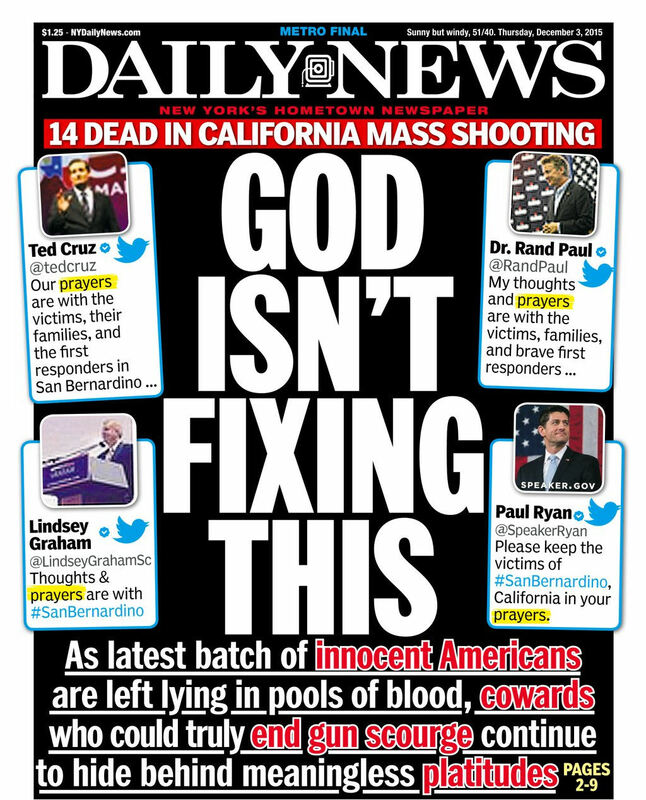 If that’s not incendiary enough to inspire a firebrand or two, there’s the front page of Thursday’s New York Daily News, covering similar ground as Volsky did, in the form of an outrageous, enraged response to “thoughts and prayers”: “GOD ISN’T FIXING THIS”. It’s artless and unsubtle, but the spirit of the message is ye olde “Actions speak louder than words.” They demand to know what each and every politician will do to ensure that not a single crowd will be fired into ever again. I don’t envy those public figures in that position, not even the ones who really would like to hire a team of Hollywood screenwriters to rewrite the Second Amendment for this gradually rebooting America that drifts farther and farther down the timeline from America Version 1.0. Is there a solution? Can we really reverse 250+ years of American history and toss out all the guns? Can we adjust our parenting basics to convince the next several waves of future American people they don’t even want guns in the first place? Or do we solve this by handing out free guns to everyone 12 and up? Is a happy medium between those two extremes remotely feasible without one side or the other having to stage a coup and make the decision for all of us? Until you can get at least two or three hundred million voters on any same page, America will remain a perpetually hung jury in the matter of The People v. Guns. What does all this have to do with our Christmas tree, pictured above? …I had to unplug from the internet for a while. I wasted an hour or so just sitting with the lights off, staring at the Christmas tree, thinking and pondering and remembering reasons why the Daily News is technically wrong from the long-term Christian standpoint, reviewing why nihilism has never been my thing, and wishing anything I did here would have a relevant, positive impact. Effective this evening and henceforth for the rest of this media cycle, apparently a guy can’t even offer up simple, sincere, heartfelt “thoughts and prayers” anymore without raising suspicions about his motives or his tax forms. So…yeah. 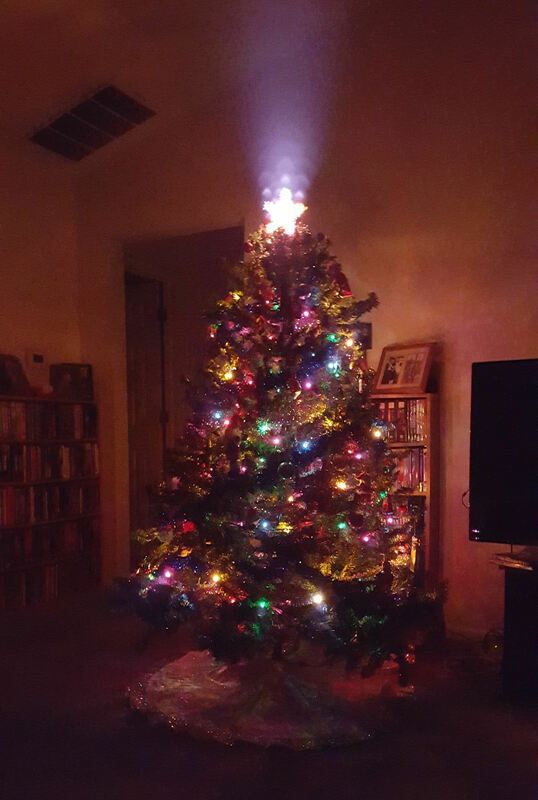 Lots of staring at our pretty lit tree. Not even the midnight release of the newest trailer for Batman Bleeds Superman: Dawn of Punching cheered me up. I knew it wouldn’t. All it did was make me yearn for a scene after the end credits in which Gene Hackman punches Jesse Eisenberg in the face. Maybe that, if nothing else, would be a cause that could unite all America once more. Well, until some angry geek who unconditionally loves Eisenberg’s Luthor comes at me with a gun, anyway. Gonna go back to staring at the tree now and pretend people are actually acting like this is the Christmas season. Wish there was a simple answer to this. But you surely can understand why there’s so much indignation from both sides. Both lives and money are at stake. True, though it’s sad it seems to be such a close call as to which is more important. So maybe my impractical solution here isn’t impractical enough, and what we actually need to do is go back in time and uninvent money instead. Nice post. And it may be hard to cheer up right now with the state of the world but seeing that warm & pretty looking Christmas tree did make me smile (well, before I read the rest of the post)! And it’s that time of year your blog is snowing–I love that. I forgot the snow was there until after I posted, and then I noticed it kicking in again. It’s a nifty annual feature built in to the blog template. 🙂 I’d like to say this entry was fueled more by sorrow than depression, but it had become one of those nights where I had things I wanted to chat about merrily but the rest of the world was singularly focused elsewhere, so I kind of had to shut up and get out of the way of those conversations. Doing better now, even though social media as a whole still seems in turmoil.